Keeping saltwater aquarium is more challenging and exciting but having more colorful pets also mean you will be facing tougher obstacles and some of the problems can be very difficult to solve. 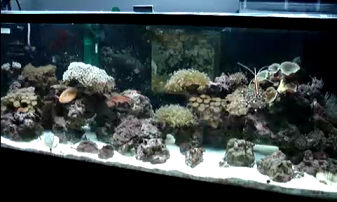 This article will go into details to explain and guide us on how we should act and deal with common saltwater tank water problems. Most often a newly set up saltwater tropical fish tank can have the water turning hazy and cloudy in a matter of hours even though you can have a well-equipped high powered aquarium filters running. This condition is usually identified to be caused by a condition known as “new tank syndrome” whereby beneficial bacteria has yet to establish itself to breakdown the waste generated by the aquarium systems. This cycling stage will normally last for about a week before it will finally clear up but the process of developing population of beneficial bacteria can be faster if there are solution of starter bacteria added to aid the process. For established tanks, sometimes expected cloudy conditions described above can also take place. For instance, if you are adding new decor such as live rocks and sands, it can also contribute towards sudden hazy water appearance. If that happens, the best thing to do is to simply remove whatever that you have been added in earlier. Sometimes you may not realize that new aquarium ornaments could be the culprit because some material of the decor can take time to disintegrate and thus problematic water condition only appears days later. Thus, you must keep vigilant and aware to detect on what is going on with your fish tank. Decaying matter such dead fish and invertebrate that once reside in your aquarium can also cause cloudy water to suddenly appear. For example, a clownfish tank with anemones population can sometimes leave unsuspected aquarist unaware of what is happening around. Anemones that are already dead will look alive to untrained eyes and it will not be noticed until it has completely shriveled up and begins to decay. Certain fish species with infectious skin disease can also cause the water to foul up easily since the aquarium is a closed system. When these happen, the most sensible thing to do is to find the root cause of the problem and eliminate it. Fish still with chance of survival should be properly quarantined to avoid the disease from spreading to your other tank pets. Imbalances in pH and shift in SG (specific gravity) is another common problem that can cause havoc to your saltwater tropical tank. Your pet will become listless, staying idle on the water surface and if this is not corrected, it will lead to disaster losing your whole stock and collection of fish. Thus it always advisable that in order to maintain a healthy aquarium system, routine test such as pH checking using test kits and salinity checking using hydrometer should be carried out at least once a week. Though it can be time consuming, at least practicing the safe approach offer a better security than having to deal with a bigger and messier problems later part.